Raj Rajaratnam, Rengan's older brother, leaves court after he was sentenced to 11 years in jail in October 2011. Rengan Rajaratnam may be following in his brother's footsteps. 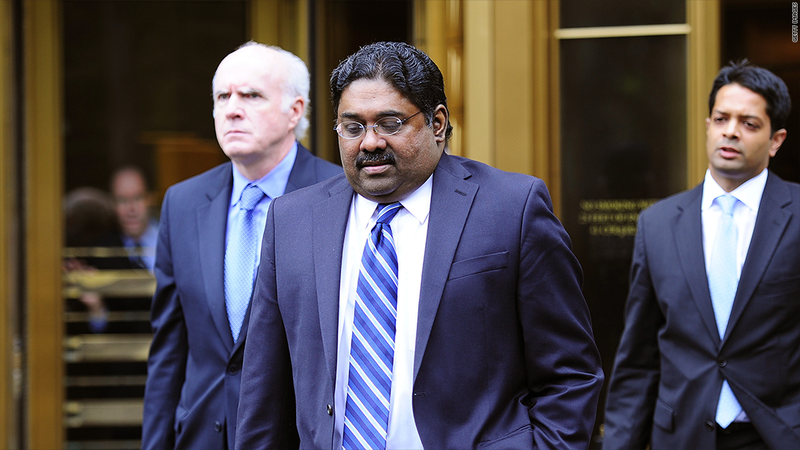 Federal officials announced Thursday that Rajaratnam, 42, has been charged with insider trading in connection with his work at his older brother Raj's now infamous hedge fund, Galleon Group. Raj Rajaratnam, 55, was convicted on 14 counts of insider trading in May 2011, accused of reaping $64 million in ill-gotten gains. He was sentenced to 11 years in prison, a record for insider trading, and fined nearly $93 million. Prosecutors allege that while Rengan was working as a portfolio manager at Galleon, Raj shared insider tips with him in 2008 about tech firms Clearwire (CLWR) and AMD (AMD). The brothers allegedly earned nearly $1.2 million from their subsequent trades. Rengan's attorney, David Tobin, did not immediately respond to requests for comment. The government has targeted Galleon over the past few years in a sprawling investigation that has ensnared a number of the now-defunct firm's former employees as well as co-conspirators from well-known companies. "Along with his brother Raj, Rengan Rajaratnam was allegedly at the heart of an insider trading scheme that swept up an unprecedented number of people in its web of corruption," Manhattan U.S. attorney Preet Bharara said in a statement. The inside information about Clearwire allegedly came from former Intel (INTC) employee Rajiv Goel, while the AMD tips allegedly originated with Anil Kumar, a former partner at the consulting firm McKinsey & Co. Both Goel and Kumar pleaded guilty to insider trading and received probation sentences last year. In the highest-profile Galleon case thus far, former McKinsey head and Goldman Sachs (GS) board member Rajat Gupta received a two-year prison sentence last year for allegedly providing insider tips to Raj Rajaratnam. Gupta has appealed the conviction.